This is a great summary of the season with out giving the big ending reveals. Check out the video above. 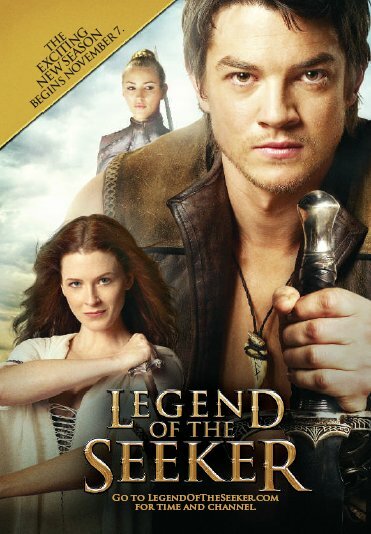 Legend of The Seeker is fantasy series based on Terry Goodkind's The Sword of Truth novel series. Season two appears to cover books two and three "Blood of the Fold" and "Stone of Tears" in which we will see the split and infighting of The Sisters of the Ageil, the return of Darken Rahl from the underworld and the discovery of a new Lord Rahl. Watch the season two trailer: Legend Of The Seeker Season 2 Preview. Legend of the Seeker Season one is one of the best produced shows currently on TV from stellar acting, breathtaking action sequences, awe inspiring scenery, and very good story. It is a must see for any fantasy / sword and sorcery fans. I would also highly recommend this show to any SF fans if for nothing else then to see what a good show should look like. Season Two is unfortunately not as strong as season one. They establish high stakes and an all important quest. Then the story meanders around the country side taking on more of an episodic TV feel rather then a continuous show. On the plus side the show gets better toward the end of the season as they get back on plot. The show also has a rushed feel to it which left me with an incomplete feeling like they just skipped large parts of the story. I expected large parts of the book to be skipped like they did with season one after all 22 one hour episodes is not enough time to cover two books. The problem is that season one proved that they can do it and do it brilliantly. What is Denna Up To? Legend of The Seeker Season Two will air on November 7, 2009 and run weekly for the 22 episodes. Being an independent production that is nationally syndicated it will appear on different times and stations across the country. With ABC behind the distribution they played a lot of games with the distribution putting episodes are on an 8-day delay delay for Hulu viewing so I watched it streaming through Netflix. This was a disappointing and frustrating addition to the viewing experience. It's another example of the big studios not getting it. Our three favorite characters will be returning: Kahlan Amnell played by Bridget Regan (on left). 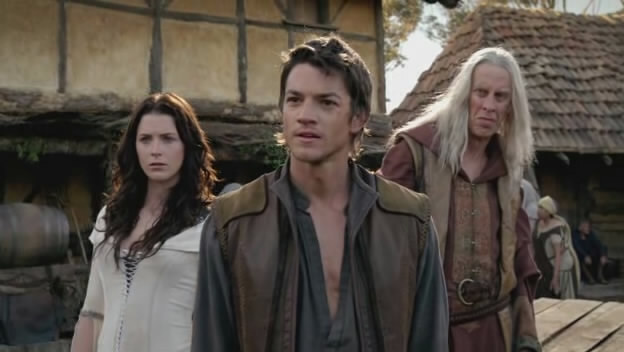 Richard Cypher played by Craig Horner (center). Zeddicus Zu'l Zorander aka "Zedd" played by Bruce Spence (right). We will also get to see a lot more of the Mord'Sith, I'm hopping to find out what happened to Denna as well. Listen to “The Confessed” a Legend of the Seeker Podcast here. Get Legend of the Seeker: The Complete First Season on DVD from Amazon.